Confidential information protection is not just a vital issue, it's the law! Recent legislation surrounding information security and privacy law requirements are far-reaching and can be very confusing. No industry sector or business size that has personal information is exempted from these laws or proposed regulations. Now a range of businesses, not previously subject to regulations, will have to adhere to these rules. If you are in business you need to have a shredding program in place. 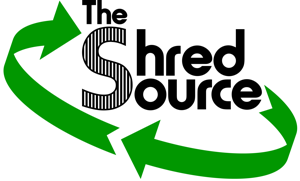 The Shred Source can deliver clarity with compliance, simple cost effective solutions for any business or residential application. Regulations such as the Health Insurance Portability and Accountability Act (HIPAA), Fair and Accurate Credit Transactions Act (FACTA), Gramm-Leach Bliley Act, Sarbanes-Oxley Act and Massachusetts privacy laws affect every business. They raise concerns about the storage, maintenance and disposal of confidential information. To reduce the risk and liability of noncompliance, entities must ensure complete security, privacy and confidentiality of all information. By recycling and preventing unauthorized access to certain information, your company can be fully compliant with privacy regulations. 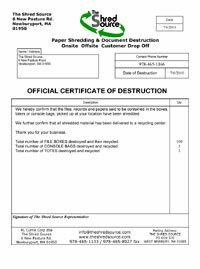 Upon the destruction of your records, we will provide you with a "Certificate of Destruction" verifying that all your information has been destroyed in a confidential manner.